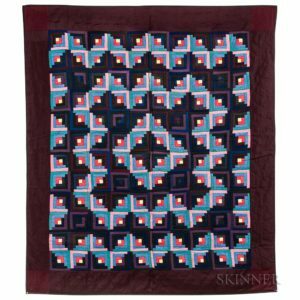 The Tom and Adelle Hersh Collection of Mennonite Quilts of Waterloo County, Ontario | Skinner Inc.
Skinner is pleased to offer selections from the Tom and Adelle Hersh Collection of Mennonite Quilts from Waterloo County, Ontario. It is a collection that Canadian quilt historian, Carol Telfer, describes as “an important piece of western Ontario textile history.” Most of the collection was assembled in the 1980’s, an era when many families were moving from the country to the city. As they collected, the Hershes were careful to record the provenance for each quilt when it was available and many can be traced to specific towns and families. Remarkably, several quilts in this collection (Lots 544, 547, and 1306) are the hand of one quilter, Lydia Martin (1892-1987), of St. Jacob’s, which descended through her family and were acquired directly from one of her daughters. The Waterloo County Mennonite community traces its origin to Switzerland (probably Zurich or near Zurich). In 1727, two brothers, David and Peter Martin, migrated to Lancaster County, Pennsylvania. Apparently, during the War of 1812, the Mennonites and Amish were persecuted by American patriots for their pacifist ideas, and a group of Mennonites decided to move to Ontario, Canada, settling in Waterloo County, between St. Joseph’s and Waterloo City. Today the bonds between the two communities remain strong and many Mennonite families from Waterloo County regularly visit friends and relatives in Lancaster County. For Mennonite women, quilts were a way of recording family histories and life stories. Often the quilted fabrics were not meaningless scraps but contained material from wedding dresses, or a brother’s necktie. Pieces of clothes of a great grandfather, grandfather, and father could be found in one quilt thus making any individual quilt a family history uniting generations. A mother and daughter could sit and look at a piece and discuss where it came from and tell stories about family events that came to mind. Also, quilts marked significant life transitions such as a birth, marriage, young man’s leaving home, or a young woman’s hope to be married which she would put in her hope chest. For some, quilts also seemed to have some “magic” properties involved with giving comfort to the sick children, or luck to the newly married. Quilts contained, woven into them, the most intimate, most important, and deepest moments of a family’s life. The quilts exhibit a rich variety of colors and patterns. Lot 547, for example, utilizes varying shades of purple and blue sateens and fine wools to create a variation of the famous Log Cabin pattern creating alternating light and dark wavy bands emanating from a central square. 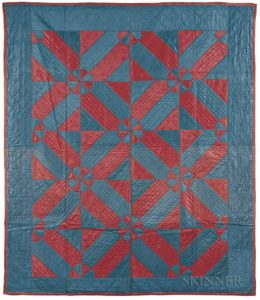 In contrast, is the Steeplechase pattern quilt, Lot 544, in which boldly contrasting blue and red glazed fabrics form a large repeating “X” pattern centering comparatively delicate flowers. Tom and Adelle have been careful and sharing stewards of their collection. Over the years, they have shared the collection with the public in special exhibitions including a 2003 showing at the People’s Place Quilt Museum in Lancaster, Pennsylvania. Visitor comments to that exhibit regularly remarked on the unique character and color patterns seen in so many of the quilts. Another showing of the quilts occurred as a special exhibit at the Robert L. Crowell Art Gallery, Newfane, Vermont. The Hersh Collection contains nearly 100 Mennonite quilts of which 25 will be offered in Skinner’s August 13 Americana auction (Lots 544-551) and concurrent Americana Online auction (Lots 1304-1309). Additional quilts will be offered in forthcoming auctions this fall and next spring. This entry was posted in Blog and tagged Americana, auction, Lancaster, mennonite, mennonite quilts, Pennsylvania, quilts, skinner auctions by Christopher D. Fox. Bookmark the permalink.